I ABSOLUTELY love Christmas. I love Christmas music. I love Christmas movies. I love Christmas lights. I love Christmas FOOD! I just love it. Since I was feeling quite festive, I thought I would paint my nails to reflect my mood! I’m still practicing getting back into doing nail art. I thought I would start off with something pretty simple. I really love how these turned out. 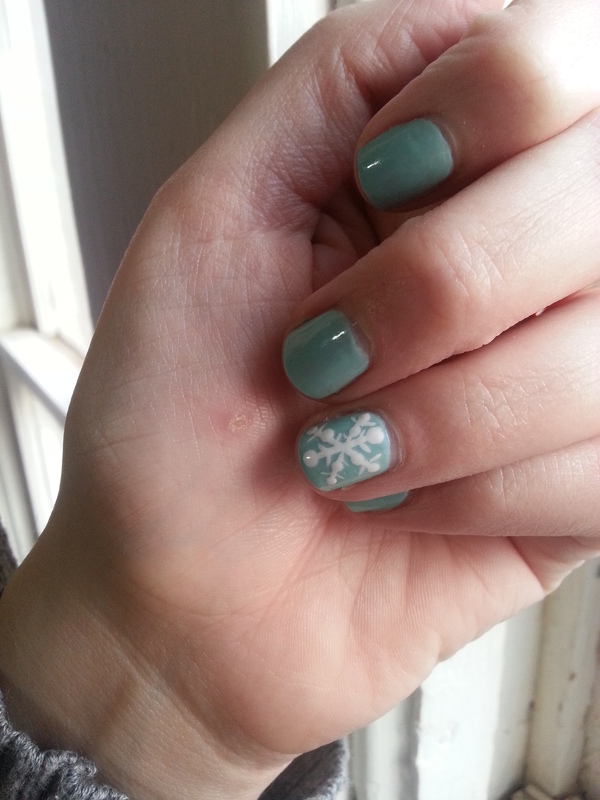 It’s just a basic snowflake being used as an accent nail. 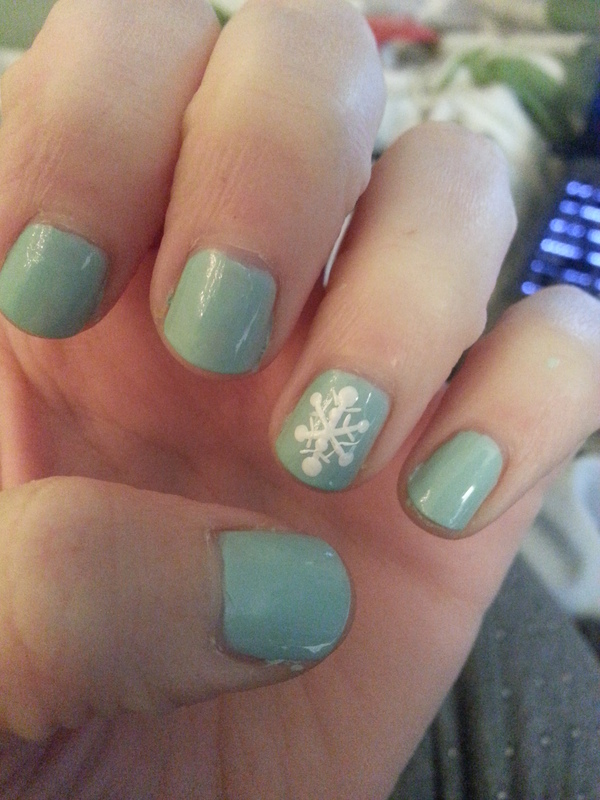 This minty type color is more of a spring color, but I think it works PERFECTLY with the holiday season. 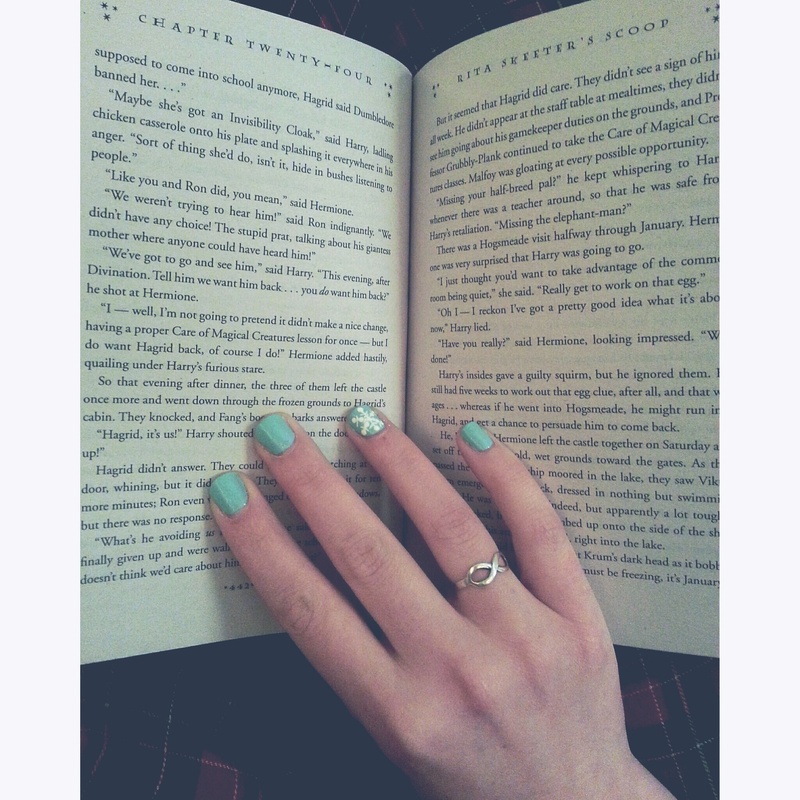 It feels chilly to me and makes me want to warm up in my blankets with a great book. I think it’s classy and not distracting. So it’s perfect for anyone! 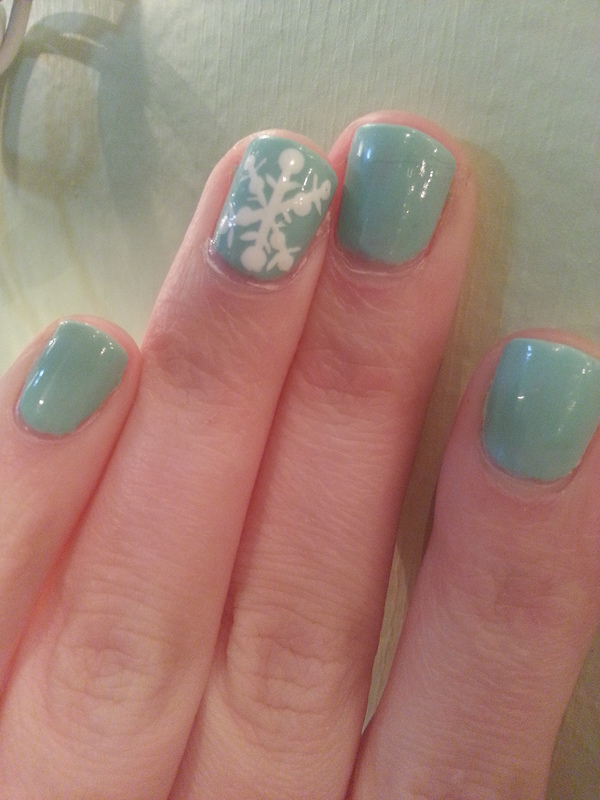 For the snowflake, you just need to make a vertical line almost the whole length of your nail. Then make an X that reaches from corner to corner. The bigger and spread out your lines are, the better this will work. After you make your lines, take some kind of tool to make dots (dotting tool, pencil, bobby pin, etc.) and make dots at the tops of your lines. I like to add a second dot to my cross lines, but go ahead and put a second dot on all the lines. Finally, in between the dots, you make little whiskers basically on each side of your lines. This is what really fills out the snowflakes. Here’s a close up of the detailed work to help you get a better visual. I’m sorry I didn’t think to take pictures of each step, but this should suffice. 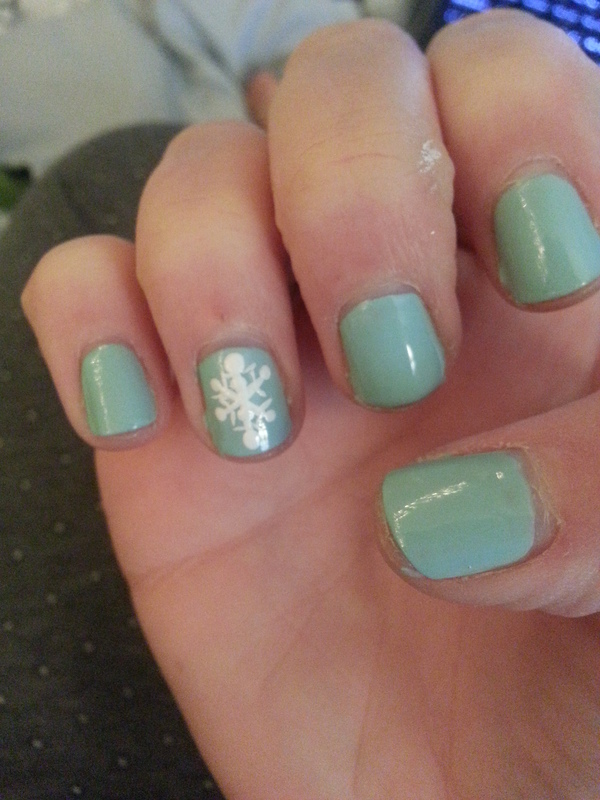 I had to redo my snowflakes because the first time they were small and crowded. I told my friend I had drunk snowflakes. Go easy on the eggnog, snowflakes! 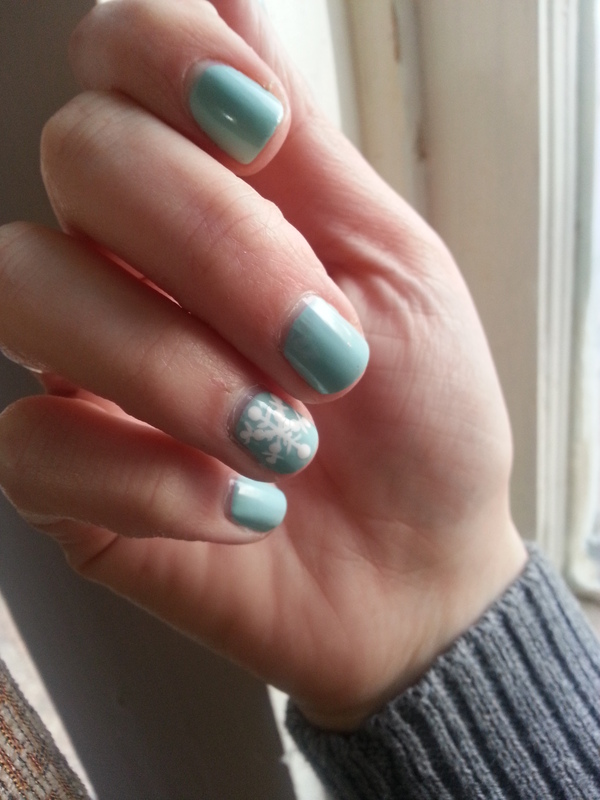 Definitely make those snowflakes as big as you can! As you can see, making them small doesn’t look right. I hope you enjoy these nails as much as I do! Hopefully as time goes on, and I practice drawing on my nails again, I will get better at this once again! This entry was posted in Beauty, Nail Art, Tutorials and tagged Christmas, christmas mani, christmas manicure, christmas nail art, christmas nail art tutorial, classy manicure, diy, easy mani, easy manicure, easy nail art, easy nail art tutorial, holiday manicure, holiday nails, nail art, nail art tutorial, simple christmas nail art, simple mani, simple nail art, simple snowflake, snowflake, snowflake nail art tutoria, snowflake nails. Bookmark the permalink.